From wikimedia commons (commons.wikimedia.org), English portable typewriter of the 1970s. From user Dwight Burdette. In the 1970s, when I learned to type in high school, typing was a loud process. Manual typewriters had a particular sound—the noise of fingers hitting the levers, the much louder smack of the letter against the inked ribbon and paper and the hard rubber-coated roller, the “ding” when you grabbed that lever and advanced your paper to the next line. The latest technology in my typing class was the electric typewriter. Its motor hummed, its clack was artificial and less loud than the smack of a mechanical typewriter, but each letter produced a quick “snick.” The ball of letters would spin and hit the paper. It was a still an audible experience, but very different—sort of like the satisfying thud of a wooden baseball bat compared to the ping of its aluminum counterpart. Today in a writing lab, I am requiring students to write a blog post—it can be about anything. It can be about writing blog posts. It can be about their favorite (or least favorite) professor this semester. I can be about Buffy the Vampire Slayer or Tessa Violet. But it’s interesting to me that the act of writing, while it is much quieter than decade ago, still has an audible quality. You can hear the fingers dancing across the plastic keyboards. Several students brought their own laptop computers, a totally legitimate thing to do, although I know from experience that many laptops have quieter keyboards than their desktop cousins. Me, I’m more of a fan of writing at a desktop computer, when I can, because my big, fat old fingers don’t always find their way well on a small laptop keyboard. No tiny orange hands for me! Don’t get me started on trying to write on a cell phone. A cell phone is Satan’s keyboard. Anyway, there is a buzz of conversation going on in class, along with the clacking of keyboards. One issue with writing in a lab situation is the distraction factor—I know I do prefer to be by myself when I write, far from the maddening (or annoying) crowd. But professional writing often takes place in distracting group environments, so dealing with distractions is a good experience for students. I assign students to write blogs for several reasons. Mostly, it’s because a professional communicator today should have a web site—blogging and other web content development is usually a requirement of a PR or journalism career. Writing a blog also provides students with a venue that reflects the reality that professional writing is a public act—a performance that is open to the world to view, which makes it different from many other forms of academic writing. And I know that blogs I have required students to write have, now and then, aided them in a job interview when the interviewer asks about their URL. They have an answer, and original content of their own to show, which can be important. But today, what I am mostly thinking about, is the sound of writing, which makes me happy. Clack. Clack. Clack Clack. What Would I Ask If I Could Ask Anything? Looking down at the crowed in the U Center, MMU, this morning. This is during interview sessions, later even more would pack the center. Given the snow this morning, turnout was great. I had an interesting morning today, participating in “Scholarship Day” at Mount Mercy University. MMU gives out one full-tuition scholarship each year, and other scholarship awards, as a result of various factors, including how well the invited incoming first-year student do in interview sessions with faculty and staff. Today, I was paired with the director of financial aid, which was nice because I haven’t had a reason to sit down and chat with her before. That’s one of the perks of Scholarship Day—being paired, as a faculty member, with someone on the staff. The kids were bright and eager, and a bit nervous. They handled our questions well. Do you laugh at lame jokes told by old people? Especially if those old people are college professors? 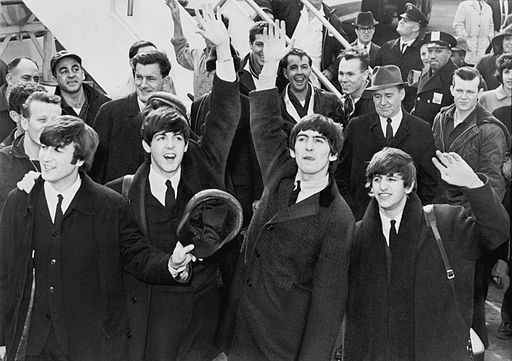 The Beatles arrive in America 50 years ago, on Feb. 7, 1964. Library of Congress photo from wikimedia.org. In the past month, what’s the longest period of waking time you’ve spent without checking your mobile phone? Can you walk up a hill every morning and recognize that it’s an opportunity to get your blood flowing and not a deficit of nature or an evil plot? In particular, can you refrain from complaining about walking up said hill, especially when you make yourself look ridiculous to an old man who rides a bicycle up that same hill every morning? Are you kind to squirrels? Are you scared of squirrels? Are you smart enough to know that there is no reason to feed squirrels? (Yes, yes, blog pals, hold on. I know, I’m not smart enough to avoid feeding squirrels. But, I don’t feed the aggressive ones found on a college campus—and neither should anybody else. They are too bold already). Are you flexible when things don’t go completely as planned? If a professor tries an experiment and it’s not a wild success, do you trash her for trying? Can you handle change with grace and poise? Will you try something new? For the first time, make music? Act on stage? Dance at a marathon? Cheer at a ball game? Play with Jell-O on a hillside? Do things you haven’t done before—take a chance just because you can? Are you a picky eater? If the cafeteria doesn’t prepare the food exactly the way mom did, is that a crisis for you? If given an open-ended license to choose whatever you want to eat from a reasonable range, do you still whine about how bad the food is? If you failed to learn in a particular class, is it always the teacher’s fault? If you get a poor grade, is it because the teacher didn’t “like” you? If you’re given a schedule at the start of a 14-week cycle and a paper is clearly listed as being due on Wednesday of week 6, do you blame someone else for not “reminding” you of what you’ve already been told? When you screw up, do you accept that you screwed up or do you blame others? Are you willing to open your mind? Can you accept that there are other points of view? Do you recognize that you don’t know it all? Are you put off by the reality that the reason most college professors think that they are smarter than you is because most college professors are smarter than you? (I’ve got news, kids. You’re 18. Most janitors are smarter than you). OK, so maybe the questions are a bit pejorative. And maybe I’m being an old curmudgeon. I suppose I have some standing for that role, and I wouldn’t want my list of questions to suggest that I didn’t enjoy meeting some pleasant young people today. I did. It’s just that there are other things I wonder about. The fact that I might be curious about some of the answer doesn’t mean I would be rude enough to ask the questions. And composing my fake interview list also made we curious about something else: What questions would my students like to direct to their professors that they don’t often get a chance to ask? Well, a number of my students write their own blogs. Final question: Any takers on that challenge? A student in CO 120 writing a blog post. I asked the students for permission before shooting them and posting these photos. 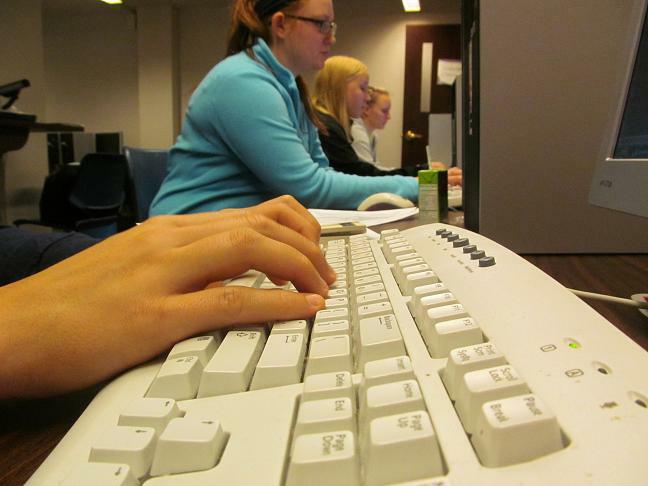 Should journalism students be required to blog? These days, with media convulsively changing, who knows what medium future journalists will use to report the day’s events. I’m a journalism professor, and I don’t. Newsweek, the iconic American news weekly magazine, isn’t available on dried wood pulp, anymore. One of the most prominent “newspapers” is the Huffington Post, which isn’t a news “paper” at all. So it seems reasonable to assume that writing for the web is an important skill. That’s my rationale for having journalism students blog. That case against? Blogging is usually emotional, and personal. Journalism, while it involves and is motivation by emotions, should be neither. The invitation to blog is an license to opine—and the instinct to opine is exactly what journalism students need to get over. If you’re doing a good job reporting the story for a credible news outlet, nobody should know your personal opinion at the end. Which means, maybe, that you ought not blog about it since blogs are all about personal opinion. Still, I think the upside far outweighs the down. Blogging means that students have a public url that exposes the world to their writing, but also means that they become more aware of the “blogosphere,” that odd zone that all reporters need to be aware of. It also gets them, if it works, into the habit of regularly originating and executing their own ideas. Anyway, my Introduction to Journalism students this semester are even now busily typing away on their first blog posts (or updates for those who already blog). Another semester has begun at MMU. I have a larger-than-usual class this semester, which, to be honest, feels great. Introduction to Journalism is a writing course that any student of any major would benefit from, since it involves bottom-line, clear writing that is more professional than writing done in many other courses. What will their blogs bring? I can’t wait to find out. 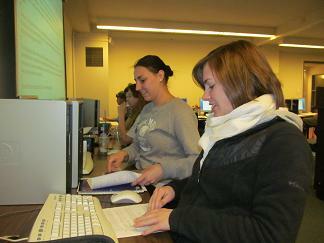 More CO 120 students typing away. Did you notice how sexually segregated the room is? There is definitely a women’s area and a men’s area. Interesting how students self segregate by gender. Not universal opinions, I know, and it is a contextual rule: I was at Prairewoods, a Franciscan Sisters of Perpetual Adoration retreat center in Hiawatha on Monday, cutting some dead limbs from pine trees, and photographing students and flowers and trees in between the work. I didn’t see any snakes, which is too bad, because during last year’s service trip to Prairiewoods, I did, and I don’t mind seeing snakes in their native habitat. Given, of course, that they are Iowa snakes—we don’t run heavily into venomous serpents here, mostly it’s garter snakes. Technically, they do have venom, but it’s not strong enough to do much to you if you’re bigger than a cricket. The day was cool and foggy, and quickly became sunny and muggy. It felt good to be outside and to do some work that is good for trees. I do like trees. I hope the students enjoyed themselves, too. Sadly, I was unable to shower before a big community meeting at Mount Mercy, so I showed up in grungy clothes with wood chips on my shoulder. 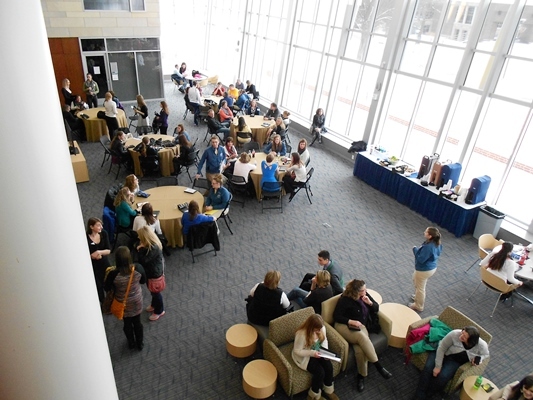 Anyway, additional photos are available on Mount Mercy’s Facebook page. Later that day, I got to speak at Founder’s Day, the official starting ceremony at MMU. I was introducing Ben Wood, a student who is Editor of the Mount Mercy Times. He promoted student involvement as a key to college success, which it is, and I think he turned “I can” into an acronym that helped him make his point. Sadly, I didn’t take notes so I can’t say more about what Ben said. Another student spoke to promote international travel, so our incoming students heard from their peers that they should join things and travel the globe. Students, if you’re reading this, as you strive to change the world, first change yourself, both by stretching yourself beyond classes (Ben’s point) and by going places you’ve never been before (Jennie Dondlinger is the student who spoke on her trip to Europe with an MMU class). Hello, my name is Joe Sheller, and I’m an Associate Professor of Communication and faculty advisor for your student newspaper, the Mount Mercy Times. It’s my pleasure to speak to you and to introduce Ben Wood, who is this year’s Editor in Chief of the Times. Ben is also a resident assistant, a member of the choir, an actor in many plays. You name it, Ben Wood would do it. He understands something that is a key to each and every one of you. Ben Wood knows, because he shows it by his actions, that what you get out of your university years goes well beyond what you learn in your classes. As adults now, you have more freedom than ever before in your lives. You can choose to succeed, or not. As a former Dean at Mount Mercy famously used to say, every student has a right to fail. 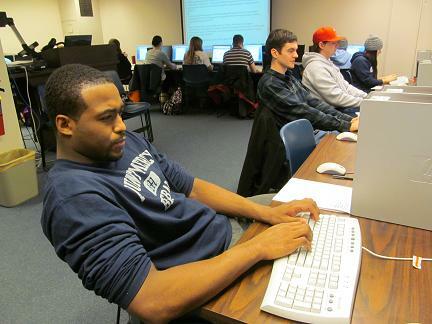 Ben joined the staff of the student newspaper, “The Mount Mercy Times,” as its business manager last year. Although his job was to sell advertising, he also wrote many stories. That interest in the editorial product translated into his current job as Editor in Chief. Flag of the MMU Times this year. Who would create it? Ben Wood would, of course. He was worried about applying for the top job. After all, he’s in so many other things—his RA job, SGA, etc., etc. But, I think, in the end, he understood the importance of some words of wisdom that were often shared by Kathi Pudzuvelis, a speech and drama professor who retired last year. MMU is a place that’s rich in “deep ends.” Whatever your major or interest, there are clubs and organizations that are anxious for your involvement. In return, you can get a priceless experience. So join the paper, or SIFE or sing in the choir or walk on for a team or find other ways to get engaged at MMU. It’s what all the smart students do. It’s what Ben Wood would do. Ben is a jumper into many deep ends. It’s my pleasure to introduce Ben to you. Class of 2016, some people who will try to grab your attention in the next four years aren’t worth listening to. Some are. If I were you, I would listen to Ben Wood. Well, I think my remarks and Ben’s and Tracy Tunwall’s (she is a Business Professor who introduced Jennie) and Jennie’s were well received, as were the points made by Dr. Melody Graham, our Provost, and Dr. Christopher Blake, our President. So it starts. No snakes, shucks, but another year underway. The start frankly feels way too busy, which is nobody’s fault but my own, but also invigorating. There’s a nice hopefulness about the start of a new academic year. May it be a year of growth and change, not just for newly trimmed and tended trees at Prairiewoods, but also for students and for the faculty who are privileged to work with them. Let the learning begin! 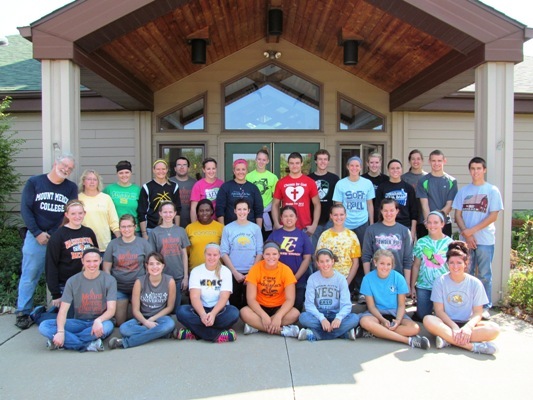 MMU service group, two portal classes, at Prairiewoods. Audrey and I, in back on left, are with our classes. If I know "suggested" friends, I might send requests, if they are not a current student of mine. Who is in your set of friends on Facebook? I was recently retained among the chosen by an acquaintance who was reducing her on-line Facebook friends list to people who she actually knows and cares about. I’ve never cut back my friends list, though I suppose it’s probably a good idea. However, since I’m not a media personality, I’m not besieged by friend requests from people I don’t know, so I don’t have Facebook tribe overload. I guess I’ve approved most Facebook friend requests I’ve received, although I won’t OK one if I don’t know the person in “real” life. I am a bit of a Facebook addict. I probably check in a couple of times a day. Mostly, I think, it’s because I enjoy seeing what comments people are making or topics they are commenting about. It’s an illustrated, more personal, Twitter feed. It’s also a bit of a short-form blog and information exchange. I like to see links that others post and sometimes end up exchanging comments on topics of the day as a result. That’s usually a nice process, although now and then someone will do something online that’s a bit over the top. A minor cautionary note, Facebook friends, remember even in the privacy of your Facebook circle, there really is no privacy when you’re on line. Students and ex students recall what your crotchety old professor told you—if it’s stored on a computer, it can be around forever and can travel the world over at the speed of light. Still, the brave new Facebook friendly world has been mostly positive to me. •	I’ll only friend you if I know you. I figure I should recognize you in the real world before I friend you in the virtual one. My rule is much looser on Twitter, which seems like a less personal site—I’ll be a twit to anybody, but only a friend to people I’ve met. •	If you’re my student, I won’t send you a friend request. Occasionally, a student of mine will ask to be my friend on Facebook. When one does, I’ll agree—I do have a friendly rapport with students and don’t post anything about myself I would object to their seeing. But, I don’t ask students to be my friend. It’s a matter of them using their judgment about whether they want me to see their on-line lives. There are some students with whom I interact a lot on a daily basis that I am not Facebook friends with, and a few that I know more casually that I am friends with—the difference is simple. The Facebook friends asked to friend me. I’ve not given the matter deep thought, but that’s just my own personal approach to Facebook, my way of maintaining both the positive relationship but the bit of distance that’s appropriate as a professor through a simple practice— I’ll approve a student’s friend request, but I don’t send requests to students. •	I routinely friend most relatives, as soon as I find them on Facebook, but only the adults. Like students, I’ll let younger relatives decide whether to approach me online. Again, as with students, a lack of Facebook friendship is not a mark of a lack of actual friendly relationships, but more a question of whether a young niece or nephew decides they want Uncle Joe to see their computer face. I leave that ball in their court. •	I will send requests to former students I knew while they were at Mount Mercy. Generally, I have to more than know their name—they had to have been a student I interacted with often enough to feel some friendship. Many of my MMU friends are former students who I taught in one or more course, and a few are even students I never had in class, but I knew them because they were either active on the newspaper or in some other activities that I was engaged in. Beware—if you graduated from MMU, I might someday send a friend request to you. •	I do send request to old friend when I find them on Facebook. 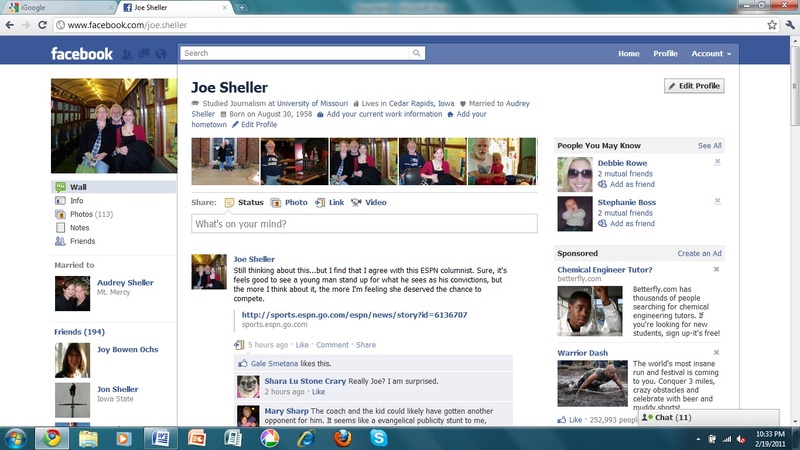 A few of the guys I knew at Sacred Heart School in the 1960s and early 1970s are now my Facebook pals. My best friend from high school is on the list. As the Facebook demographic has aged, that’s one of the nice things the site provides—the chance to get caught up with actual long-time friends. I’m not always consistent in following these guidelines. I’m not terribly rigid or rule-oriented with Facebook—I guess I’m more describing my Facebook habits than any set of guiding principles. I originally joined Facebook because of the connections it helped me maintain with my own kids when they were in college. No, I wouldn’t be distant from a child of mine absent Facebook; it’s just Facebook provides a nice day-to-day connection. Two of my kids still are in college, but four have graduated. Facebook still works that way—it’s nice to see into Ben’s and Nina’s college days, but also to keep up with Amanda, Jon, Theresa and Katy in their post college lives on Facebook. Anyway, that’s the way I like it. For the most part, I know my Facebook friends on-line and in the world. And I do enjoy seeing the news from my cyber tribe.